I’ve always been one that leaves various notes lying around. Despite that I’m on my computer quite often I’ve never really gotten into typing notes out. I prefer bright yellow post-it notes. However, the down side is that sometimes I just need the info written down for a couple of minutes and it seems a waste to use a whole note for that purpose. Which leaves me with post-it notes with all kinds of things scribbled out and written in the corners. Instead of going that messy route, you could pick up this mouse pad. It’s definitely a quirky design, but it’d be great to write something down in a rush. 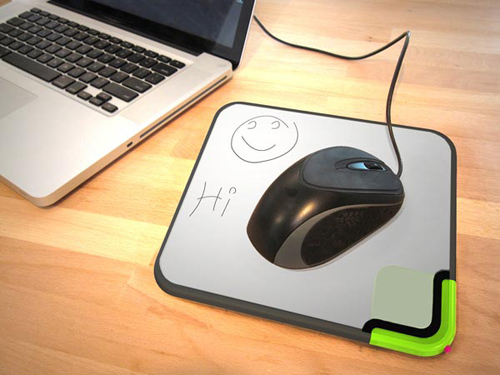 The Noteable Mousepad, Scratch-n-Scroll, can be written on with the included stylus or with the tip of your finger. In order to erase what you’ve written, you just lift the sheet on the top. The pad will work with both not only optical mice, but the old fashioned ball kind as well. Right now this isn’t out just yet, but you can pre-order the product. When it does get shipped out to you, you won’t even have to pay for shipping. The mouse pad will cost you $14.99 from Quirky Designs. Although I am not that big into mouse pads, as far as mouse pads go this one is actually interesting.